NarniaWeb Community Forums • View topic - Armor! So what do you think of it? Certainly looks like a new direction. Practically speaking, it makes sense that armor being used by a crew at sea would be different. Lighter for one thing. I think that's part of the reason for the change in style. I'm not totally sold on the look, but it is nice to see some fresh design. glumPuddle wrote: ... but it is nice to see some fresh design. At first look without seeing anything close-up, the word "fusion" comes to mind. 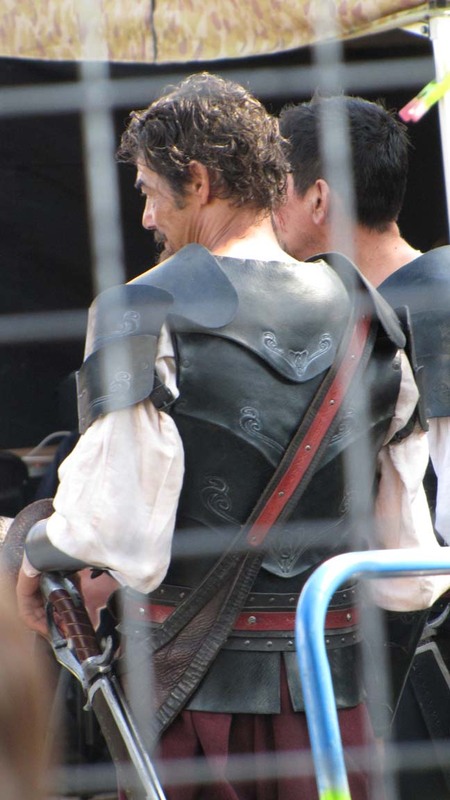 But I seem to think this only when looking at Caspian (Ben) and Edmund (Skandar), as their spaulders (shoulder protectors) are different than the rest of the armored crewmen. Sensible armor for protection against projectiles? I guess I don't have much of an opinion about the armor. Just the observation that it seems to fit in with the rest of the world. I mean it doesn't seem like a huge departure from what we've seen before. I'm not really sure what to think about it. I don't not like it, it just looks so different. I guess I was kind of hoping for similair armour to Ed and Peter's in the first two, especially with Aslan on the chest. As gP said, though, it makes sense to be lighter, but they just look so... weird (translation:different). Anyway, it's clear I don't know what to feel about this, so I'll probably give my opinions later. I like the gold shoulders. That has the potential to be very visually striking. I also think it makes sense for them to go for something lighter, more flexible, and easier to put on. They're going on a sea voyage, not into "pitched battle" (supposedly ). Actually, I think that this armor has good implications about the whole "pitched battle" issue. If they were planning on PC scale epic battles, they might have given the crew better armor. well i do agree that it does look light, as opposed to the heavier looking medieval armor from PC. but then again everything about their costumes look lighter as well. i first noticed that with their boots, and the general design of clothes is drifting towards the romanticism of Old Narnia, so i guess the armor should follow suit. although personally i was hoping for something a bit better. they did add some details to the armor and it is Narnia-ish, but theres something about the quality that's missing in these armors that is quite evident with those done by Weta Workshop. i couldnt quite put my finger on it, but looking at these armor closely and then comparing it with all the other work Weta Workshop has done for other movies, you can clearly see the difference. btw, does anyone know which FX house is taking care of practical effects? the ship is beautiful and the details exquisite, kinda hard to believe that it would be from the same effects workshop that does the armor. ...the Telmarine who saved Narnia. I don't know why, but I've absolutely fallen in love with this new armor (ok, I do know one reason why, but we aren't allowed to fangirl). But I think it looks practical, from a sea-voyage standpoint, and it seems to be a mix of Telmarine and Narnia, which I like. I always thought it would be a bit weird if the Telmarines threw away 1300 years of culture and fashion overnight and return to ancient and archaic Narnian style. A mix of the two better shows the blending of cultures, and the combining of two people into one. I think it's kinda...ugly. I mean, I like the lighter look for a sea voyage, but....I don't know. As always, I will reserve my final judgment until I see the finished film. I really like it, I agree the lighter the better plus I think that leather wouldn't rust or need as much mending as steel or iron though I'm not an expert on armor. I think Edmund and Caspian look Kingly and stand out from the rest of the crew. I was worried for a little while that they weren’t going to wear any armor at all. And would have been really disappointed because I like the scene when Caspian and the crew get on their armor and march through the streets of Narrowhaven to confront Gumpas and rescue Lucy, Edmund, Eustace and Reep. JadistarkilleR wrote: btw, does anyone know which FX house is taking care of practical effects? the ship is beautiful and the details exquisite, kinda hard to believe that it would be from the same effects workshop that does the armor. I haven't been able to find out which company is the direct replacement for Weta Workshop on this movie, but i did find out that Talerwin Forge seem to be the company making the armour and weaponry (though probably not desigining it) for this movie, essentially making them the replacement for ARGO who did pretty much the same task on Prince Caspian (i.e. making weapons and armour). So I was looking at some of the pics while I was uploading them to our image gallery and I think the armor is actually a heavy leather instead of metal. That is a great shot, fk. It does appear to be leather, like centaur armor, or even Susan's bit of armor she wears in PC. It's really tough boiled leather (cuir boulli, it's called), though... the leather would be boiled in water or wax until pliable, then formed into the specific shapes needed, and then dried until it was hard and tough. I really like the gold plate armor that Ed and Caspian wear in addition to leather... their pauldrons (or, as ceppault said, spaulders, which is probably more technically correct) and vambraces are plate. The new armour is definitely much different than the armoury used in the first two films. Since it doesn't look like anything they've done before, that's a plus. But I liked how the previous armour looked, colour combinations and all. Can't really judge it until the movie comes out to see how it looks when all the camera and lighting is done. I don't really like how the shoulder parts look much bigger than the actors' shoulders: it makes the armour look like it doesn't fit right. i get that the armor should be lighter since they are not exactly going into a major battle, and i do think the armor should be a blend of Narnian and Telmarine styles, but i still would have loved the lion on the front, but i guess i'm more a fan of Narnian armor than Telmarine anyway. Oooooooh armor... I could very easily give long winded speechs on armor. I won't though. I would think that the leather armor would be more practical than metal when at sea. It makes sense. More than that I think it is the whole cliche feeling of pirates and rogues that makes it feel right more than anything. When you think of seafaring tales the pirate ones will probably come to mind first. Now, pirates were kind of hodge podge and there armor would be gained by making it themselves or more likely stealing it from someone else. If they made it themselves leather would be the easiest and cheapest choice for only rich men could afford plate armor. If they were fortunate to steal armor from the rich most of his goods would be sold and only perhaps the officers and the captain would keep armor for themselves. I think that rogue feel and hodge podge feel comes through really great in this armor while still retaining Narnian order and craftsmanship. It's kind of cliche and not perhaps authentic that it captures the rogue feel but you have to admit that you immediately think "ship" and "sea adventure" when you see it!